The B-movie is a subjective thing. 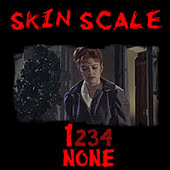 One man’s trash is another man’s treasure and in the forties, B-movie horror was running rampant. Aging star Bela Lugosi was part of countless low budget treasures, the saving grace of a dozen or so films. Pegged as a horror star, Bela never got the respect he deserved in Hollywood, no matter how many legitimate classics of cinema he appeared in. 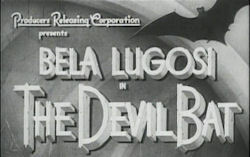 The Devil Bat is one such B-movie that Lugosi was part of during this time, one that has been overlooked by many and is probably owned by more, being a part of countless public domain sets out there, most priced to fit any budget. Dr. Paul Carruthers (Bela Lugosi) has been experimenting with a new type of aftershave for the Morton Heath cosmetics firm. It’s not just an ordinary lotion, however, this one has a special power. The ability to attract a massive bat created by Carruthers himself by genetically mutating its body by sending electric current through its glands. Prior to this, Dr. Carruthers had been inventing cosmetics for the company and received $5000 cash, rather than opting to be a part of the company. A bad decision indeed as the company made over a million bucks in the last year alone. Upset about the company getting rich off of his work, he begins giving the head honchos at the company samples of his cologne, always being sure to bid them “good bye” in a very malevolent manner. The guys at Morton Heath aren’t all bad, they plan to give Dr. Carruthers a $5000 bonus for his dedication to the company at a special event which Dr. Carruthers believes will be the announcement of a marriage. He skips the event, citing he was busy with his work. No matter, one of the associates comes to his home to present him with the cheque. The doc gives instructs the man to rub the lotion on the tender part of his neck and after he leaves, he lets the mutant bat out of his attic and it hunts down the man wearing its most hated scent. The media gets a hold of the story and a reporter, Johnny Layton and his photographer, One-Shot McGuire are sent out to cover it. Johnny gets in with the local police and they follow some leads, most coming up short. As the bodies pile up, they realize that every victim was wearing the same strange but unknown fragrance. They eventually trace the fragrance to the doctor, but can they get to him before the Devil Bat gets to them? The Devil Bat is a cheapie, but the bat effects don’t look that bad, especially considering how poor some of the effects were done in later Hammer movies over 20 years later. An extreme close-up of a real bat is used to scare audiences, although you wonder if they were frightened by it, even in 1940. The mad scientist is always a great staple in the genre and Lugosi is in fine form here, taunting his victims and even daring the police to catch him, offering them small hints of truth when they ask him for advice. There’s quite a bit of lame old B-movie humor to be had and the acting and script is adequate for a movie of this nature. One of the most unintentionally funny scenes is when One-Shot meets a French maid and gets her to pose for some pictures and she obliges. He asks her to show a bit more skin and she lifts her skirt all the way up… above her knee. Wowza! It’s not suspenseful, the bat’s howl sounds like a bird, there are no crazy plot twists, it’s all pretty linear and simple, but it’s still enjoyable because of Lugosi’s performance as well as the overall idea of a fragrance attracting a killer bat so as to not leave any evidence behind. It’s not a bad way to cover up your tracks at all. At the time, the film must have been moderately successful, because there is a sequel, Devil Bat’s Daughter, without Lugosi. It seems that the sequel would be a dud without the great actor telling people who line their throat with the scent, “I don’t think you’ll be using anything else!” The Devil Bat is actually the first Lugosi film I had ever seen, buying it cheap around ten years ago when I was just starting high school, those were the days. I remember being surprised at how good it was for a black & white movie, but now that I’ve seen the classics and a few other great ones, it shows just how much true quality the film lacks. Not to mention Lugosi’s awesome role as Ygor in the Frankenstein series as well as doing the best portrayal Dracula the world has ever seen. The lack of a gothic setting (although there is a touch of it) hurts the film, but it’s a fun ride while the 70 minutes last. 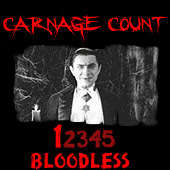 The DVD is pretty dark and grainy, but the price is right. Perhaps you have this one kicking around on a set and passed it off as trash, which if that’s the case you should pop it in your DVD player the next time you get the hankering some some fun from the days of old. Who knows, it may make you think twice about handling that decades old bottle of cologne in your father’s medicine cabinet. Rent it!